Embrace Island style adventure in the Crazy Shirts Women catalog, with fashionable and feminine outfits featuring cute shirts for women that will take you island hopping from the beach to the boardwalk and poolside with ease. Savings will be automatically applied at checkout on the Crazy Shirts website. Tops - If you're a gal who loves to hit the sand and surf, you'll love the collection of cool and comfortable dyed womens tees in stock, featuring fun and flirty mini t shirts, scoop neck tees, rib knits, and more styles that showcase all-original screen-printed artwork. Browse a variety of cute shirts for women from their specialty dyed t shirt collections to find your favorite long sleeved and short sleeved styles, colors and designs as well as Pima cotton tops and tank tops, chill proof hoodies and pullovers that will keep you warm once the sun goes down. Pants & Shorts - From walking shorts to sport on land to board shorts to sport at sea, you'll find a casual collection of womens beach wear including tops and bottoms that are on trend, in style, and always the perfect fit. You'll find crop pants, adjustable relaxed pants, reversible board shorts and more stylin' gear designed and reserved especially for today's fashion forward beach babe. Dresses & Skirts - Transition easily from a day at the beach to a moonlit walk on the sand with easy to wear beachwear for women including comfy beach dresses made from luxurious and exceptional soft 100% pima cotton fabric. Cover up in pretty printed skirts in flattering A-line silhouettes that will complement any silhouette. Accessorize with cool sea-inspired jewelry including pendant necklaces and earrings that will complete any seaside look. Men's wear - Besides featuring an easy and breezy collection of womens beach wear, Crazy Shirts also helps you dress up your dude with dyed men's t shirts that they'll live, lounge, surf and breathe in. Choose from long or short sleeved tees dyed in a well of crazy stuff including beer, wine, chile, rum, hemp, Kona coffee, chocolate, key limes, and more novelty dyes that are high in flavor, bold in color. Stock up on polos, twill pants, shorts and board shorts featuring the casual and flattering fits he loves. 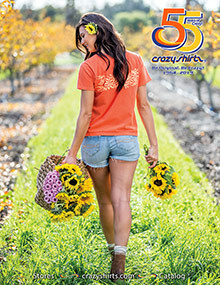 Crazy Shirts is your Hawaiian source for beachwear for women, featuring cool graphic dyed womens tees and outfits that you'll wear all summer long, and all year round.